November 30: Amidst all the misery of the Novitzky/US Postal investigation and what will probably be an endless Contador doping scandal here's something to really enjoy. A friend sent me two terrific You Tube links. The second is from the stage 12 timed hill climb to San Marino in the 1951 Giro d'Italia. Giancarlo Astrua was the shock winner, beating Coppi by 20 seconds. He took the maglia rosa from Fiorenzo Magni after winning this stage. Magni took the Pink Jersey back for keeps in stage 18 in one of the most extraordinary rides in cycling history. It was incredible for the courage Magni showed risking his life on a descent of the San Lugano that left the great Belgian flahute Rik van Steenbergen afraid to follow. Here's a link to watch Astrua, Bobet, van Steenbergen, Bartali, Koblet and Magni in the stage 12 San Marino hill climb. Enjoy. November 16. The Associated press says that Jeff Novitztky, the US Food and Drug Administration agent investigating allegations that Lance Armstrong doped, has traveled to Lyon, France accompanied by Travis Tygart, the CEO of the U.S. Anti-Doping Agency. France's Anti-Doping Agency (AFLD) has already said that it will honor an official request to share information with American investigators. November 14. 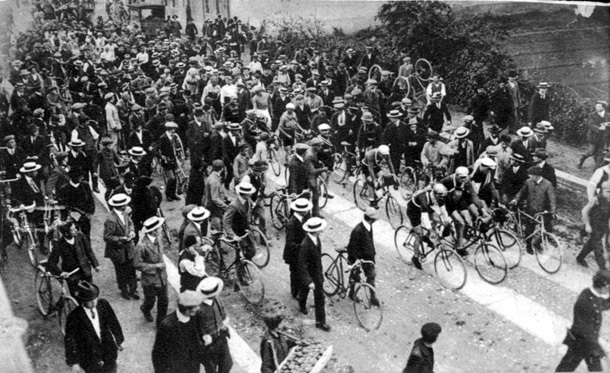 I love this picture of the start of the 1912 Giro d'Italia. It's May 19 and the riders are leaving (I assume) Piazzale Loreto in downtown Milan for a 399-kilometer stage to Padua. It took winner Giovanni Micheletto 13 hours, 26 minutes and 47 seconds to complete the bottom-numbing stage. The 1912 Giro was a team race, calculated on points and the winner was Atala. Note the boy selling fruit at the bottom of the picture. A lot of the spectators, very natty in their straw boaters, clearly traveled by bike to watch the departure. The racers' bikes are fixed-gear. They all have food bags on their handlebars and carry spare sew-up tires looped around their shoulders. I apologize for the lack of updates on the site for the last month. To the exclusion of almost everything else, I have been working on my Story of the Giro d'Italia. I have just this morning finished the first volume which covers the Giro from its origins in 1908 and 1909 to Merckx's second victory in 1970. Now it has to be edited. I think it'll be available in January.